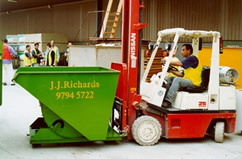 J.J. Richards & Sons Pty Ltd has designed and manufactured tippler bins for customers who are using compactors and bulk containers/skips for the disposal of waste materials. 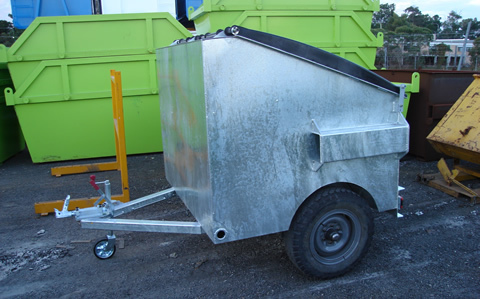 The bins are suitably sized to allow for placement at strategic locations throughout a site and are designed to allow for easy transport using a forklift. Tippler bins are constructed by J.J. Richards engineering company J.J. Richards Engineering Pty Ltd in accordance with relevant Australian Standards and Guidelines. There are two sizes available to suit your needs. Our specialized sales representatives will be able to assist you to select a size suitable for your needs. Increases efficiency as personnel spend less time away from their tasks. J.J. Richards take pride in our ability to design, implement and operate the best system for each situation. In order to do this we listen to the needs of our customers and, where necessary, design and manufacture new plant and equipment to meet these needs. 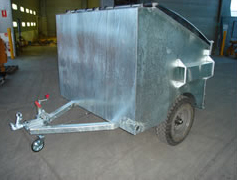 The towable bin is one such innovation. 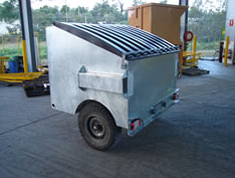 Towable industrial bins have been designed in response to requests from customers for safe, easy and convenient movement of industrial bins on-site.